For our anniversary Shawn custom painted a pair of converse shoes for my fiancé. I brought him the shoes and gave him a general idea of what I wanted. 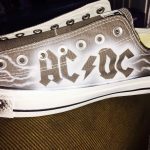 My fiancés favorite band is AC/DC so I wanted something unique, simple, and clean (easy to see) on the shoes. I thought it would be a fun one of a kind gift. Shawn was very clear about price and timeline which I appreciated a lot! He had them done a little earlier than expected. I immediately loved the shoes when I picked them up! Clean, simple, and a fun representation of the band. I’d definitely ask him to do more projects in the future.